Thirsty? 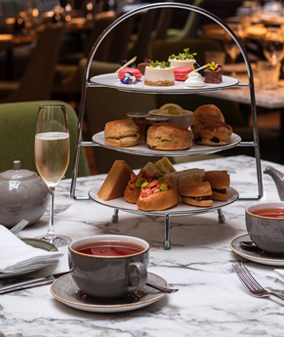 Receive 20% off when you sign up to Tea Society or are already a Tea Society member from 21 February to 3 March. Offer can be used in conjunction with the Storage tin offer. Offer does not apply to gift cards. Offer excludes Tea Time, teas purchased with the 20% discount cannot earn a stamp. 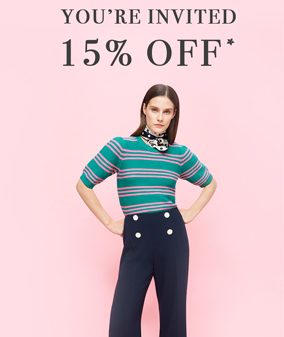 This weekend, celebrate the latest arrivals at L.K.Bennett and join the team in store and receive 15%* off on the new collection whilst enjoying complimentary refreshments whilst you shop. *full price items only, cannot be used in conjunction with any other offer. Strolling down Pavilion Road, you’ll find Wulf & Lamb – one of London’s finest vegan hubs. 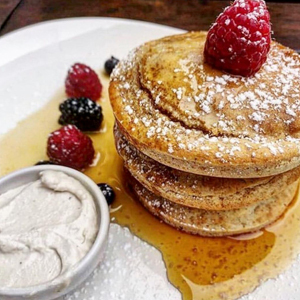 Start your morning with the fluffy American pancakes (£9.95), stacked up high, doused in maple syrup and topped with mixed berries and vanilla cashew cream. 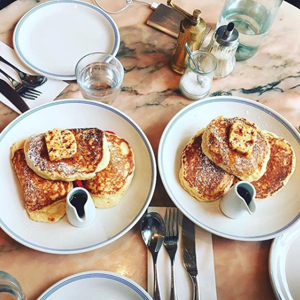 Carrying on up one of London’s most beautiful streets is Granger & Co. Their legendary ricotta hotcakes (£12.95) come with a glowing reputation and a delicious accompaniment of banana and honeycomb butter. You’ll go flippin’ crazy for these! 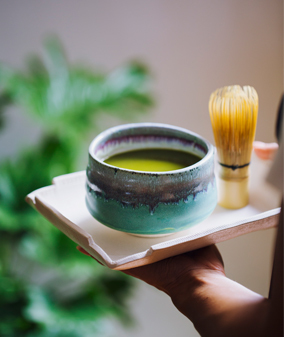 In the heart of Chelsea is Sloane Square, home to Chelsea locals’ favourite hot-spot, Colbert, inspired by the great boulevard cafes in Paris. 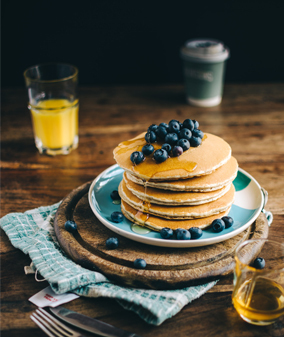 Sit back, relax and enjoy a feast of a morning with their buttermilk pancakes. Add bacon (£10.75), or add berries (£12.75) or prefer your pancakes straight, have ’em plain (£8.50). A stones through away is Duke of York Square. The much-loved pancake man from L’Amouse Bouche will be on hand, taking up residency outside Partridges, for the whole of Pancake Day. Grab your crepes on-the-go. If you’re on a health kick, Farm Girl Chelsea should be top of your destination list. 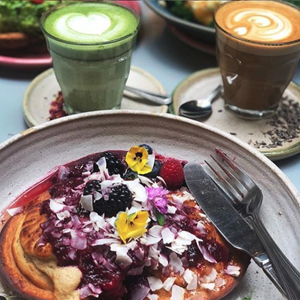 Their buckwheat flour and buttermilk pancakes (£12) will fill any hungry tummy, arriving with maple syrup, berries, candied pistachios and coconut shavings and will leave you guilt free! 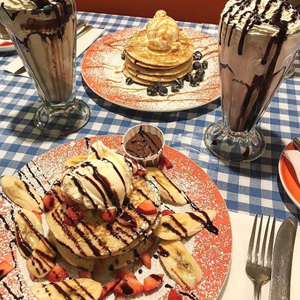 However, if health isn’t such concern on this day of indulgence then My Old Dutch is the place for you; pancakes all day, both sweet and savoury. Got a sweet tooth? Try yours topped with banana, nuts and ice cream, drizzled with chocolate sauce (£9.25). Prefer a more savoury option? Order the Eggs Florentine (£10.95); creamed spinach, cheese, topped with baby spinach, red onion and sunny side eggs. Delish! Further up the King’s Road is one of Chelsea’s instituations, Bluebird. Bask in the sunshine on the terrace at the café and tuck into an unlimited stack of pancakes. Can you think of anything ‘batter’? 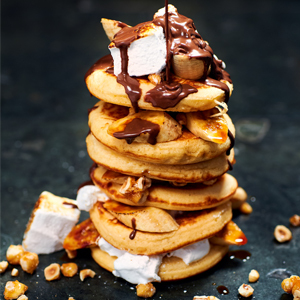 For just £30, enjoy two hours of bottomless pancakes with a variety of sweet and savoury toppings to accompany bottles Prosecco. More info and booking here.